Dr. Fitterman is Vice Chair of Hospital Medicine of Northwell Health. He became a hospitalist after 14 years in private practice, the last three of which he also served as Medical Director of a 40-physician multi-specialty group in Huntington, NY. Dr. Fitterman has also been appointed associate Professor of Medicine in the newly founded Hofstra University School of Medicine and participated in supervising the introduction to the clinical experience outpatient initiative of the school. He serves as Chair of Internal Medicine Board Exam Committee of the American Board of Internal Medicine (ABIM). 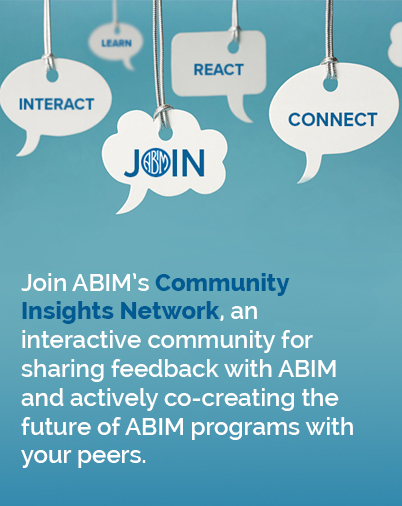 ABIM’s governance has evolved to bring in fresh voices that reflect the diversity of our profession. ABIM’s 20 Exam Committees consist of practicing doctors, from various regions, practice settings and age ranges. These volunteer physicians are responsible for creating examinations for Certification and Maintenance of Certification (MOC) in Internal Medicine and its subspecialties. Working together, the members of each Exam Committee play a crucial role in defining their respective disciplines by developing the examinations that focus on what a physician needs to know to practice in the field. It is the goal of every Exam Committee to create exam content that is relevant to practice. Exam Committee composition is vital to developing ABIM examinations that are indeed relevant to practice. Only then do we achieve the goal of creating meaningful tools of professional self- regulation. It is therefore of paramount importance that those who serve on ABIM’s Exam Committees have not only the required subject matter expertise, but also reflect the range of perspectives and practices within the discipline. In order to assure that our Exam Committees achieve these goals, we have developed guidelines for how we identify and select new members. In our continued efforts to increase transparency, I am pleased to share these guidelines with you, our internal medicine community. Exam Committees will recommend new members not only based on their subject matter expertise, but also on how the committee reflects the discipline as a whole. Exam Committees actively seek to maintain diversity with respect to demographic composition, geographic location, and practice setting. For example, on my Internal Medicine Board Exam Committee, we will include some hospitalists and some physicians whose practice is entirely outpatient. The recruitment process will include public outreach to targeted individuals and groups, including but certainly not limited to relevant medical societies and even high-performing examinees on recent MOC exams. Subject matter expertise and other characteristics that the Exam Committee seeks will be made clear when an opening is anticipated. In turn, potential members will be asked about their relevant characteristics and experiences, as well as their goals in serving on the Exam Committee, and finally any conflicts of interest they may have. ABIM will continue to provide training in item-writing to new Exam Committee members, along with mentoring from the Exam Committee Chair and other experienced members. The Exam Committees, like all of ABIM governance, engages in continuous self-evaluation and process improvement. These recommendations will be reviewed following the first year of implementation to see how they are working to meet the goals of developing Exam Committees that reflect the discipline. Based on this review, the recommendations may be modified as needed to enhance the quality of Certification and MOC exams in order to best meet the needs of physicians and relevancy to their practice. All of this supports the work and mission of ABIM to uphold the standard of excellence inherent in our profession, and we are proud to carry out this work.